2. Combine spices in a small bowl. Place potatoes in a shallow dish. Lightly drizzle with 1 Tbs. oil, sprinkle with half of spice mixture, and toss to coat. Gently scoop seasoned potatoes onto hot tray. Roast for 15 minutes. 3. Meanwhile, place pork in same dish used to season potatoes. Add ½ Tbs. oil and remaining spice mixture. Season and turn to coat. 4. Prepare salsa: combine tomato, avocado, onion, coriander, chilli if using, lime juice and 1 Tbs. oil in a large bowl. Season and gently toss to coat. 5. Heat a medium frying pan on medium-high heat. Cook pork for 2 minutes or until browned all over. Transfer to baking tray and place with corn alongside potatoes. Roast for 15 minutes. Transfer pork to a plate and loosely cover with foil. Stand for 5 minutes to rest. Roast potatoes for another 5 minutes or until crunchy. 6. Serve sliced pork with potatoes, corn and salsa. Garnish with lime wedges. 2 Combine spices in a small bowl. Place potatoes in a shallow dish. Lightly drizzle with 1 Tbs. oil, sprinkle with half of spice mixture, and toss to coat. Gently scoop seasoned potatoes onto hot tray. Roast for 15 minutes. 3 Meanwhile, place pork in same dish used to season potatoes. Add ½ Tbs. oil and remaining spice mixture. Season and turn to coat. 4 Prepare salsa: combine tomato, avocado, onion, coriander, chilli if using, lime juice and 1 Tbs. oil in a large bowl. Season and gently toss to coat. 5 Heat a medium frying pan on medium-high heat. Cook pork for 2 minutes or until browned all over. Transfer to baking tray and place with corn alongside potatoes. Roast for 15 minutes. Transfer pork to a plate and loosely cover with foil. Stand for 5 minutes to rest. 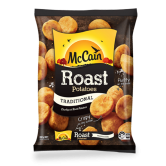 Roast potatoes for another 5 minutes or until crunchy. 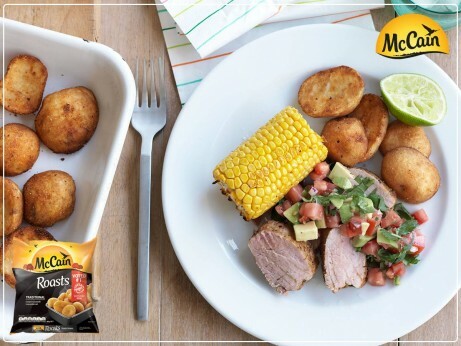 6 Serve sliced pork with potatoes, corn and salsa. Garnish with lime wedges.